Plant secondary metabolites are unique sources for pharmaceuticals and food additives. Orange jessamine (Murraya paniculata) contains secondary metabolite that is beneficial to human health including lowering blood cholesterol levels, anti-obesity, and has the antioxidant capacity. Leaves of orange jessamine have several chemical constituents including L-cadinene, methyl-anthranilate, bisabolene, β-caryophyllene, geraniol, Carene, 5-guaiazulene, osthole, paniculatin, tannins, eugenol, citronelled, coumurrayin and coumarin derivatives. 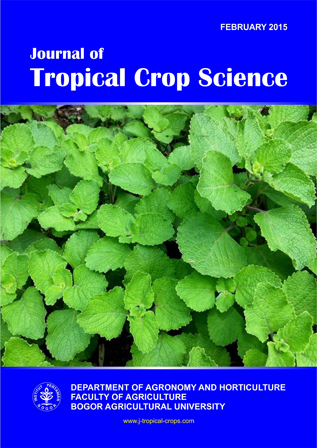 This study aimed to determine the correlation between leaf concentrations of N, P and K with leaf bioactive compounds following chicken manure application to the plants. The experiment was conducted at IPB Experimental Station at Cikarawang, Bogor (6o30' - 6o45' S, 106o30'-106o45' E) from March to November 2014 (250 m above sea level). The study used a randomized block design (RBD) with rates of chicken manure as a treatment, i.e. 0, 2.5, 5 and 7.5 kg per plant. Chicken manure was applied at 30 months after planting (MAP). Leaves were harvested by pruning the plants to a height of 75 cm above the soil surface. The results showed that the optimum rates of chicken manure to produce maximum fresh and dry leaf weight were 3.1 kg and 6.5 kg per plant, respectively. This rate was sufficient for leaf production at the first harvest (34 MAP) but was insufficient for the second harvest (38 MAP). K concentration of the leaves from different positions within the plant and leaf age positively correlated with leaf dry weight (P <0.01), but negatively correlated with total flavonoid content (P <0.01). Leaf P concentration was negatively correlated with dry weight of the 5th young leaves, or mature leaves from all positions. Leaf K concentration was categorized very high (3.59-4.10%), whereas leaf P concentration was high (0.28-0.29%) to very high (0.33-0.35%). The 5th mature leaves determined plant K requirements. Anderson, C.A., Graves, H.B., Koo, R.C.J., Leonard, C.D., and Reese, R.L. (1968). “Methods of analysis”. Florida Agricultural Experiment Station Project 1398. Lake Alfred. Florida. Brand-Williams, W., Cuvelier, M.E., and Berset, C. (1995). Use of a free radical method to evaluate antioxidant activity. Lebensm-Wiss u-Technology 28, 25-30. Chang, C.C., Yang, M.H., Wen, H.M., and Chern, J.C. (2002). Estimation of total flavonoid content in propolis by two complementary colorimetric methods. Journal of Food and Drug Analysis 10, 178-182. Hardjowigeno, S. (2010). “Ilmu Tanah”. CV Akademika Pressindo. Jakarta. Havlin, J.L., Beaton, J.D., Nelson, S.L., and Nelson, W.L. (2005). “Soil Fertility and Fertilizer, An Introduction to Nutrient Management”. 528 p. Pearson Prentice Hall. New Jersey. Heyne, K. (1987). “Tumbuhan berguna Indonesia”. Badan Litbang Kehutanan, Jakarta. Hermanto, Ghulamahdi, M., Darusman, L.K., Sutandi, A., and Bermawie, N. (2012). Penetapan bahan diagnosis status hara NPK pada jaringan tanaman pegagan. Buletin Penelitian Tanaman Tropika 22, 186-197. Iswantini, D., Silitonga, R.F., Martatilofa, E., and Darusman, L.K. (2011). Zingiber cassumunar, Guazuma ulmifolia, and Murraya paniculata extracts as antiobesity: In vitro inhibitory effect on pancreaic lipase activity. Hayati Journal of Bioscience 18, 6-10. doi:104308/hjb.18.1.6. Kardono, L.B.S., Artanti, N., Dewiyanti, L.D., and Basuki, T. (2003). Murraya paniculata (L.) Jack In “Indonesian Medicinal Plants; Monograph and Descriptions” (T. Basuki, L.B.S. Kardono, K. Padmawinata, eds), p.360-375. PT Gramedia Widiasarana Indonesia. Jakarta. Lozano, F.C. (1990). “Soil and Plant Analysis: A Diagnostic Tool for Nursery Soil Management in Planting Stock Production Technology”. Training Course Proceeding No.1. Marschner, H. (1995). “Mineral Nutrition of Higher Plants”. 672 p. 2nd edition. Academic Press Limited. London. Mattjik, N.A. (2010). Murraya paniculata In “Tanaman Hias dan Bunga Potong” (A. Purwito, ed). p 245. IPB Press. Bogor. Pane, M. (2010). “Uji efek ekstrak daun kemuning (Murraya paniculata (L.) Jack) sebagai penurun kadar kolesterol darah marmut jantan (Cavia cobaya)”. Skripsi. Universitas Sumatera Utara, Medan. Payet, B., Sing, A.S.C., and Smaja, J. (2005). Assessment of antioxidant activity of cane brown sugars by ABTS and DPPH radical scavenging assays: determination of their polyphenolic and volatile constituents. Journal of Agriculture and Food Chemistry 53, 10074-10079. Rohman, A. and Riyanto, S. (2005). Daya antioksidan ekstral etanol daun kemuning (Murraya paniculata (L.) Jack) secara in vitro. Majalah Farmasi Indonesia 16, 136-140. Shabala, S. and Pottosin, I. (2014). Regulation of potassium transport in plants under hostile conditions: implications for abiotic and biotic stress tolerance. Physiologia Plantarum 151, 257–279. Sims, D.A. and Gamon, J.A. (2002). Relationships between leaf pigment content and spectral reflectance across a wide range of species, leaf structures, and development stages. Remote Sensing Environment 81, 337-354.